Tall 16" Monogram Chimney Letter - - distinguished home accent for your chimney, front door, porch column, or interior wall. Just about anywhere you want to display your monogram. Made in USA. All castings are handmade and finished with baked on satin black finish. that stands up to the harshest elements. 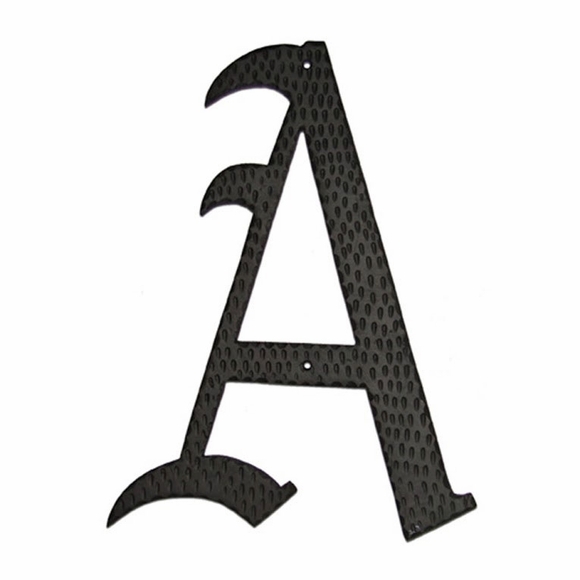 16" high chimney letters range in width from a 6" wide letter I to a 13.25" wide letter M.
Stately Old English Style Monogram letters are suitable for residential and commercial display. This looked like the perfect answer to the decorating problem, and it really is, for us. Great quality and finish Measure twice and cut once is the important message to this review. This was supposed to live over our fireplace, however MY error ordered the smaller product. When speaking with comfort house about an exchange was told that this is a custom product and not eligible for an exchange. It is great, it now lives in the kitchen as opposed to the fire place, which is still bare.